Modern business is changing, and our industry is no exception. Transportation and logistics, specifically, is transforming as businesses look to improve speed and efficiency. This issue of MHI Solutions tackles how to effectively manage these changes, from best practices in sustainability to the impact of autonomous vehicle technology and the growing role of 3PLs to the impact of the recently expanded Panama Canal on global trade and commerce. These “big picture” trends are putting a new focus on transportation and logistics management as firms look to their supply chains to create savings. The one common theme in addressing these issues is collaboration. Collaboration between suppliers, the user community, academia, industry associations and government is essential to improve supply chain performance, increase operational efficiency and reduce costs. One way MHI is supporting this collaboration is at our ProMat expo next April in Chicago. ProMat 2017 has expanded into two halls at McCormick Place and, for the first time, will feature Solution Centers on Sustainable Facility and Autonomous Vehicle solutions. These new Solution Centers will feature exhibits and education highlighting these two important supply chain trends. You can learn more in this issue and at ProMatShow.com. Additionally, MHI continues to expand the educational and networking offerings at our MHI Executive Summit and Annual Conference events being held in October in Tucson, AZ. This is the second year we have invited MHI members and non-members to attend, creating a unique event venue for this collaboration. The goal of these events is to transform our industry into a growing community that shares knowledge and collaborates to address current and future manufacturing and supply chain challenges and opportunities. 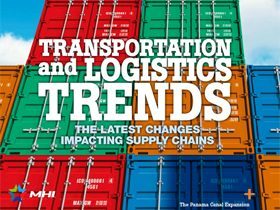 Supply chain thought leaders like Vivek Wadhwa (Duke University), Dee Ann Turner (Chick-fil-A), Alan Amling (UPS) and Sherry Harriman (Walmart) among others are sharing insights and strategies on the issues affecting supply chain leaders. Next year’s MHI Executive Summit and Annual Conference will be held October 1-4, 2017 at the Boca Raton Resort in Boca Raton, FL. We hope you will make plans now to join us there. Our objective is that this issue of MHI Solutions helps provide the information and resources you need to address the accelerating change the transportation and logistics industry is facing to transform your supply chain and improve overall business performance. Read the new issue of MHI Solutions.